You’ll eat only the meat you and some friends have hunted—with some exceptions—for a year. 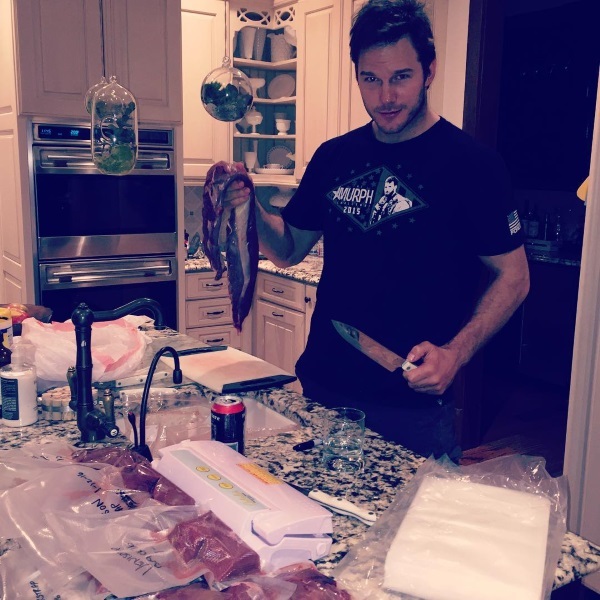 Apparently, Chris Pratt has been inspired by a recent hunting trip to adopt a meat-driven diet plan. And he wants you (he’s a guy’s guy, afterall) to join him. Read all the details in this amazing stream of consciousness below. Most likely he’s kidding, but who knows, maybe “The Game Plan” will take off. The “Taco Cleanse” is a real thing, so why not a game meat diet? In fact, there are some actual health benefits of game meat. It’s packed with protein, for one. Here are seven wild game recipesthat prove it. Maybe it’s how Pratt dropped 60 pounds in 6 months… just sayin’. “Here I am vacuum packing some deer meat in the kitchen. I grew up in the woods. Not literally. I mean, we had a house. I wasn’t raised by coyotes. But I spent a lot of time in the woods. Hunting, fishing and being outdoors with my friends and family is how I spent my free time as a young’n. That part of me will never change. I mean. I’m assuming. I don’t know. Maybe it will. It hasn’t yet. Maybe one day I’ll wake up and be like, “I’m only gonna eat veggies for the rest of my life.” If I do that’s cool. It’s a free country. Anyways. I just filled the freezer with a bunch of tasty meat from an awesome deer hunt in the great state of Texas. Oh! I should tell you: I’m going to start a diet I called “The Game Plan” where basically I only eat wild game for a year. “The Game Plan,” get it? Cause GAME? I mean I’ll also eat veggies and fruit and other stuff too. But for one year I want to eat only the meats that were caught or killed by me or my friends. Total free range organic wild game! The game plan. Join me.